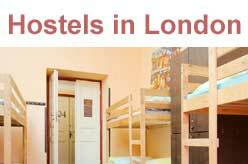 List of all hostels in London, England. 162 bed hostel located in the heart of London and within two minutes walk from Kings Cross and St Pancras stations. Located in close to both Kings Cross & St Pancreas Station, minutes from Oxford St, Piccadilly Circus and the markets in Camden Town. Backpackers Hostel in Kings Cross, London. Offers mix of private rooms and dormitories. Dorms range between 4 and 18 beds. Private rooms are available as singles or twins. Palmers Lodge’s luxury London hostel in Swiss cottage is a award winning chain of hostels in Central London. Voted London’s Most Popular Hostel By Hostelworld in 2011, 2012 and 2014. 40 College Crescent, London NW3 5LB, UK. Located in North London, Willesden Green. Hostel near Wembley stadium London. Perfect for large school groups, college groups and groups of friends. Hostel offers free continental breakfast from 7.30 am to 10.00 am. 233 Willesden Lane, London NW2 5RP, UK.